Chicken Fillets Stuffed | Packington Free Range | Born and reared outdoors. Always. You don’t need to dine out to eat good food. 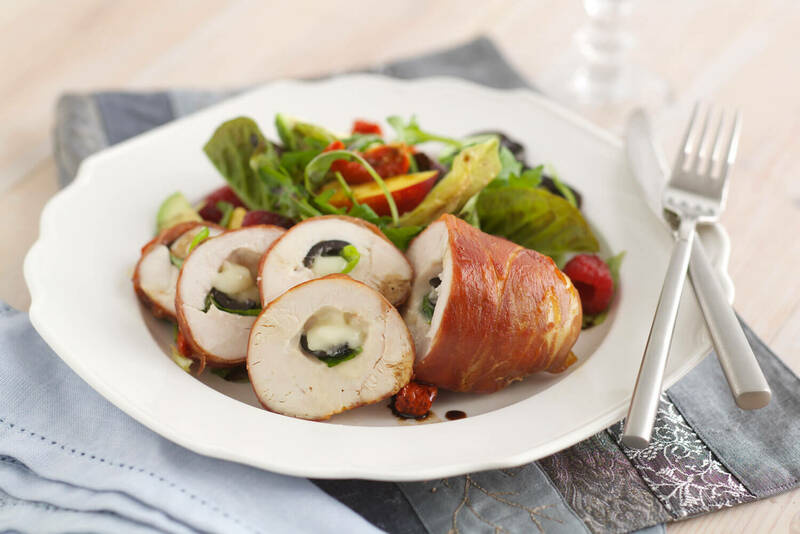 Chicken breasts with fragrant basil and taleggio cheese, checkered with pitted black olives wrapped in parma ham is a true indugence. Serve up with a fresh, sweet salad; crisp lettuce and peppery rocket jewelled with nectarines, raspberries, avocados and sun-kissed tomatoes. Using a sharp knife cut long deep pockets into the side of each chicken breast. Slice the Taleggio into 4 equal size pieces. Divide the cheese, olives and basil leaves between the pockets of each chicken tucking in well to completely enclose. Wrap each breast in 2-3 slices of Parma ham to enclose completely. Place on a baking sheet, cover and chill for 30 minutes. Heat 1-2 tbsp of the olive oil in a large frying pan and cook the chicken breasts for about 20-25 minutes, turning occasionally until browned all over and when the chicken is pierced with a skewer the juices run clear. Remove from the heat, place on a warm serving plate and keep warm. Meanwhile divide the lettuce, rocket, nectarines, raspberries, avocado and tomatoes between serving plates. Add the remaining oil and balsamic vinegar to the pan scraping together with any pan juices. Slice the chicken breasts and arrange on salads. Drizzle over dressing and serve immediately.